Review by AllTheBestFights.com: 2017-11-11, pretty good finish between Raphael Assuncao and Matthew Lopez but it is not enough to get three stars: it gets two (UFC Performance of the Night). The black belt in Brazilian jiu-jitsu Raphael Assuncao entered this fight with a professional mma record of 25-5-0 (52% finishing rate) and he is ranked as the No.9 bantamweight in the world. He lost to current #1 Ufc Bw champion TJ Dillashaw in 2016 (=Dillashaw vs Assuncao 2) but then he has defeated Aljamain Sterling (=Sterling vs Assuncao) and Marlon Moraes (=Moraes vs Assuncao). His opponent, Matthew Lopez, has an official record of 10-1-0 (80% finishing rate) and he entered as the No.31 in the same weight class. He also lost once in 2016, against Rani Yahya, and then he has won twice: with Mitch Gagnon and Johnny Eduardo. 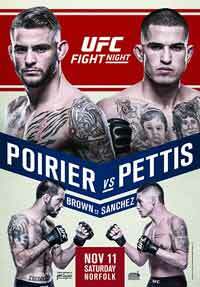 Assuncao vs Lopez is on the undercard of Dustin Poirier vs Anthony Pettis – UFC Fight Night 120. Watch the video and rate this fight!